Copiers and printers are awesome office tools -- as long as you don't run into any kinks like slow printing, paper jams or poor image quality. Here are some quick and easy things you can do if you run into a jam. Help! The printer is taking forever. There are a couple reasons for this. If you need a lightening-fast print job and aren't keen on quality, select the standard or draft feature in your printer driver. Your document may be taking awhile because it is printing images. Also, another slowing factor is if your printer is in power saving mode. Help! There's a paper jam. Paper jams are bad news when you're in a hurry. Jams will happen so be prepared. In advance, make certain that your printer supports the paper being printed. Check the paper path and clear away foreign material. Be sure and pull the paper out straight when removing it. Torn paper is not your friend because removing pieces of torn paper is time-consuming. When printing labels, review the printer's instructions. Static electricity -- in this case, place paper in the fan to help avoid clinging. Moist paper -- make sure that your paper is dry. Store in a low humidity settings. Improper alignment -- watch out for non-straightened stacks of paper. Stack uniformly when placing in your paper tray. Help! Poor image quality is on the radar. Poor image quality is usually also a simple fix. Are your print driver's settings selected correctly? Are you printing with paper that matches the type selected in the print driver? Make sure your toner cartridges are undamaged. 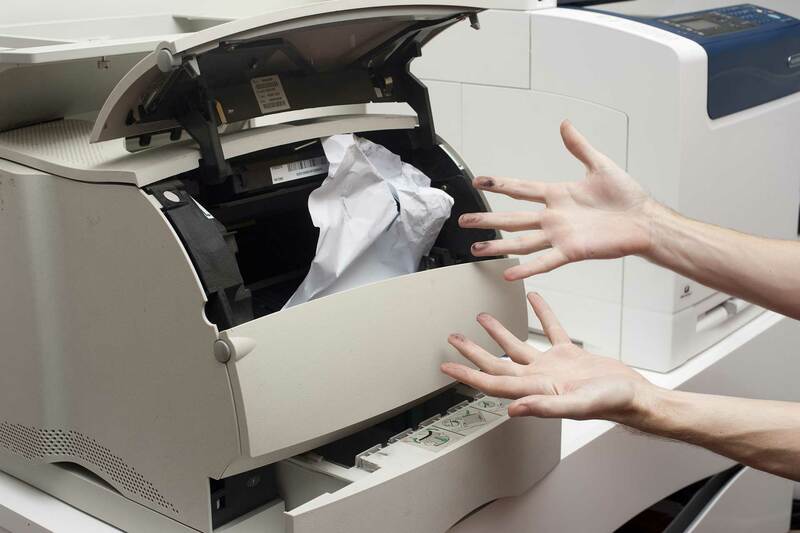 If your copiers, printers or MFPs are producing smudges, print several blank sheets of paper until the problem is cleared. Contact us for more information about our products for your office, or fill out a service request for tough jobs.